Left: Great US reedman, Kenny Davern: Coops was the only clarinetist in England who scared the hell out of him. Alan always answered the ‘phone, in a rather dignified voice, by stating simply: “Cooper”. He always signed his letters “Coops”. I once made the mistake of introducing him as “My old friend, Alan Cooper”; “I’m not old” came the reply. Indeed, he wasn’t ever old. “I don’t know what I’m going to do when I grow up,” was one of his observations during a discussion about young children. We were playing, as a duo, at a school in the Middle East. I don’t quite remember why we were without the other members of the British All-Stars, but we had to play for a half hour to 5-10 year-olds. At the end of the informal concert, the children’s appreciation was loud and long. I glanced at Alan, and I believe I saw tears glistening in his eyes. Warm-hearted wouldn’t begin to describe him, as any one of his many friends will confirm. Spending time with Coops was always good value, and we had plenty of time on the various Middle-East tours that Dave Mills put together. There are dozens of stories…. Bruce Turner was guesting on one trip. It was like working with Jimmie Noone and Johnny Hodges in the front line. Alan’s feature number was “Strangler on the Floor” (with apologies to Mr. Acker Bilk). Resplendent in his white dinner jacket, black bow tie, etc., his attire was completed – for said solo outing – by a battered bowler-hat which perched on the top of his head, looking slightly embarrassed by being there. The routine went something like this: The first chorus – in the key of Eb – was played most beautifully in tribute to the original version. In the second chorus, Alan changed to the key of E Major. However, the rhythm section section stood its ground, and continued on its way – in Eb. The effect of the resulting non-euphonious sounds registered disbelief on the faces of the audience. On completing the second chorus, the clarinet was building-up for the big finish, when Dave Mills – secreted in the audience with a bird call about his person – started twittering on that very instrument. Alan – head cocked to one side – twittered back. This went on for some time; most of the audience had realised by this time that it was a spoof. Coops remained dignified, as always, even after the big-finish – or rather “the business” to quote a “Cooperism". Unfortunately, on one occasion, a member of the audience was a native of Pensford – Acker’s home town – and set about Alan verbally, accusing him of insincerity, amongst other things. He just wouldn’t listen to Alan’s reasoning – or ‘piff-paff’, as he would have described it. “I rest my case,” and so saying, Alan strode off in the direction of the bar. The following year, we toured in the summer time, which was stiflingly hot. Alan and I shared hotel room for four or five days in Abu Dhabi. Two single beds, one on either side of the room. The air-conditioning could be adjusted easily enough – there was a small light over the box on the wall – but knowing whether it should be left on… halfway… or turned off completely was a subject for experiment. On the first night, I adjusted the air-conditioning, and on the second night, Alan adjusted it. There was a brief silence whilst we both thought about the question. Suddenly, a sort of gurgling noise issued from the direction of Cooper.. and then gales of laughter from us both. We didn’t actually stop laughing for an hour… Well, about 25 years really. Alan raised his hand, and sort of wiggled his fingers in acknowledgement. On the 15 February, 1931, Gordon Alan Cooper, Alan Swainston Cooper, the Professor, and Coops – all one person – entered this world. 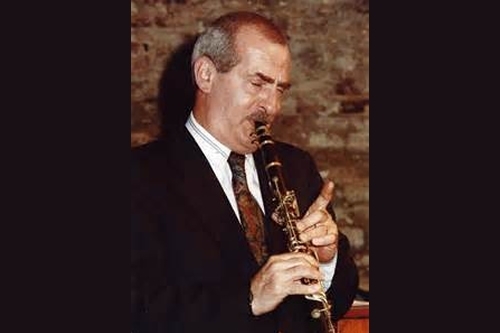 Coops, as I remember him, brought with him a wealth of talent – as a painter, sculptor, teacher and musician, became one of the most original Classic jazz clarinetists in the UK and Europe – if not the World! I have very many fond memories of Coops and I list but a few. We formed the British All Stars Band in 1979, primarily to tour the Gulf States, the first time any British entertainers, let alone jazzers, had done this. Prior to that, Coops and I dreamed up the idea of taking the Temperance Seven on to Concorde, to be the first musicians to play at the speed of sound. In fact, Coops composed the “Mach 2 March” to celebrate this. After two years of planning and negotiating with BA, on the 31 March, 1976, we all boarded the BA Concorde flight to Bahrain and, an hour into the flight, the Chief Steward asked if the two of us would like to look at the flight deck. Coops took over, from Cyprus, and did! The following 25 years work in the Middle East was the result of that trip.